Dimensions 36" wide X 82" high X 24" deep. 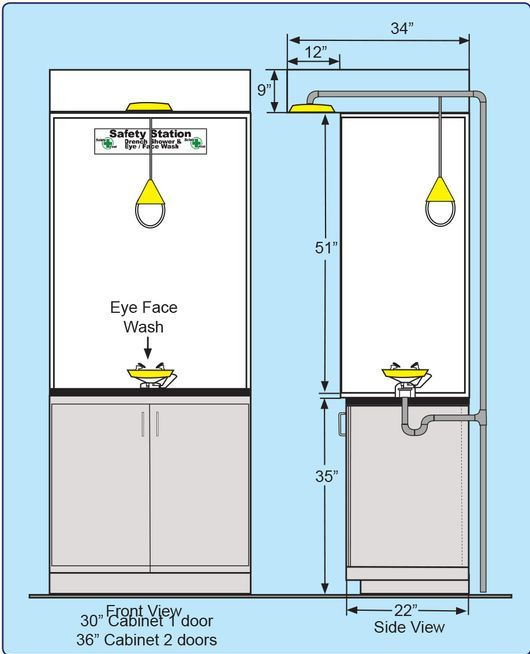 Unit is constructed of 3/8" polypro and equipped with hand held eye / face wash with 8' coiled hose, deck mounted eye / face wash and storage cabinet for safety supplies. •Shower head manufactured of UV resistant high visibility yellow ABS plastic. •Shower head delivers a minimum of 20" diameter pattern to the target area 60" above standing level. • Combination shower and eye/ face wash shall deliver 30 gpm @ 30/70 psi of flowing pressure from the shower head and 8.0 gpm @ 30/70 psi of flowing pressure from the eye/face wash.
Certified to ANSI Z358.1 shall deliver 30 gpm @ 30/70 psi of flowing pressure from the shower head and 8.0 gpm @ 30/70 psi of flowing pressure from the eye/face wash.